There was once a time when 3D printing something at your own backyard seemed like a very impractical and impossible thing to achieve. But today, with the continuous enhancements in science and new technology every day, just thinking of something and printing a 3D model of it is very easily possible. And all that just at your backyard. Now, you can simply get yourself your own very 3D Printer and start printing out your own 3D objects and models without having the need to go through all the complications that would have been once there. Today you get several CAD applications and software online which makes designing and modelling your own 3D objects a piece of cake. Even a kid with very minimal computer skills can easily pick up the knowledge and start building himself or herself their very own 3D objects with the help of such 3D printers you find today and the CAD software that most of the time come along with them. Let us then start by trying to understand what the whole concept of 3D printing is. So, when we say 3D Printer or 3D Printing. What is the first thing that comes to your mind? I would assume it would be the image of a mechanical hand printing out an object that is 3 dimensional in nature. Yes, when it comes to 3D Printing or 3D Printer. The main reason that makes it so different from other printers is its ability to give your ideas or designs a 3 dimensional structure and shape. 3D printing like any other printing method is the process of turning a digital data into a more tangible object. When we talk about 3D Printers. They too like other normal printers have a number of key components which make the printing process possible. And without these components printing out a perfect output would hence be very difficult. Thus, it is a good to know and understand the role each component has to play. A frame is nothing but a chassis that holds the whole machine together and gives a more robust foundation to the entire structure. The main purpose of the frame is to maintain stability and accuracy during the printing process. Whenever a printer head moves from one position to the other, it may cause the whole printer to feel some kind of turbulence or the other. Due to such shakes the printer might not be able to print out a perfect and precise 3D Model. Thus, because of this reason a strong frame is very vital when it comes to differing a good printer from a not so good printer. The Printer head, also known as the extruder may very well be the most important component of all. A printer without an extruder is like a pen without a nib. An extruder consists of mainly four parts; a nozzle from where the material comes out, a heating coil to melt the material, a motor which helps in pushing out the material and a temperature sensor which is used to maintain the temperature of the extruder. All these parts work together in sync to allow the printer head to print out a perfect object. The build bed is nothing but the platform or base over which the entire 3D Model is printed out. Unlike 2D Printers, when it comes to 3D Printers the print head movement must not only be limited to X and Y plane but must be allowed to move in all X, Y and Z directions. Thus, it is important that the Printer Head Arm which holds the Extruder must be able to move along the X, Y and Z planes. Let us next have a look at how a 3D Printer actually works and what are the key components needed to create these 3 dimensional objects. The main principle behind the 3D printing technology is additive manufacturing. As the name itself suggests, additive manufacturing basically means that in 3D Printing, an object is built additively one layer at a time in sub mm scale, because of which an object gets its rigidity and structure. The reason why 3D Printing stands out from any other manufacturing process like casting, moulding or machining is because in all these cases, an object is manufactured or built by subtracting material from a larger block whereas in case of 3D printing all manufacturing is done simply by adding up material to form the desired object. And hence, in case of 3D printing the amount of material left over or wasted is greatly reduced as compared to traditional manufacturing methods. This is the first and foremost thing you will need to understand before getting started with 3D Printers and 3D Printing. Just like for a good building, you need a good foundation. Similarly, for a good 3D object to be printed, you need a good and uniform design. It is in the way you design your object that will decide how sturdy and strongly built it will be. So, to start off with the designing section, the very first thing we will need is a CAD (Computer Aided Design) software. A CAD software is a software which helps in the designing of 3D objects according to the desired dimensions and ratios so that it can be printed easily and proportionally by a 3D Printer. Today, there are a number of such CAD software available there in the market. Some are open source whereas some are paid and there are others which come together along with the purchased 3D Printer itself. Below is a list of such CAD software categorised accordingly. The second most important step is known as slicing. In this process the 3D model which has been designed is then sliced into a number of distinct layers, so that it can be converted into a readable input file for the 3D Printer to read and print accordingly. The slicing process too takes place inside the CAD software itself, and only once it is done that the sliced file is sent to the 3D Printer next for printing. Out of all these materials the most widely used material is Plastic. Again when we talk about which material a printer uses. And depending upon that, the process of printing may differ too. Thus all these components like Printing processes, type of Printer and the type of material used, go hand in hand and are dependent on each other. 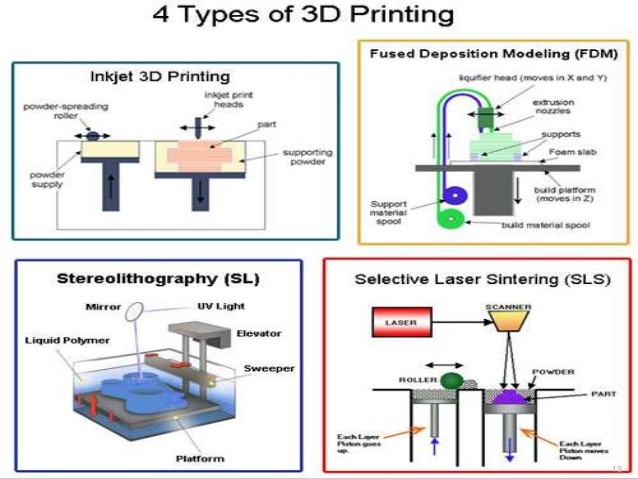 So, to understand better the categorization process and the types of 3D Printers, we will next need to have a look into the different printing processes out there. FDM, just as the name itself suggests is a 3D Printing technique which works by depositing melted thermo-plastic filament. This plastic filament is first heated up and melted in an extruder or printer head and is then pushed out onto the build bed one layer after the other. As the layer keeps on assembling one on top of the other, the previous layer below gets cooled down and hardens gradually. In the FDM processes at entry level ends, the most widely used thermos plastic materials are ABS ad PLA. However, with recent development and enhancement in the FDM technology more other types of materials are also coming up very soon. The SLA process of printing requires the use of photopolymers (a light sensitive polymeric material) as their base printing material. Photopolymers are basically a special type of plastic material which may change its properties when exposed to light sources ranging from ultraviolet to visible light. Stereolithography is one of the first 3D Printing technology to be commercialized and with that grew its popularity among low end users too from beginners to intermediate professionals. The SLA process works with a lot of precision and accuracy to build out the final product. The accuracy comes from the use of an ultra-violet laser which reacts with the special polymer material (photopolymers) to solidify into a solid substance. This goes on one layer at a time in the XY axes. As one layer gets completed the bed over which the photopolymer resin is kept moves down vertically in the Z-axis. In this way the whole object is formed by gradual solidification of photopolmer resins as the laser gun moves horizontally in the XY plane and the build bed moves vertically in the Z plane. One of the very oldest 3D Printing processes, the DLP technology is very much similar to Stereolithography when it comes to working with photopolymer resin material and the use of a light source. However, the light source in case of DLP is quite different from that of an SLA which uses an ULTRAVIOLET laser. When working with the DLP technology, the light source may be an LCD panel or an arc lamp. Also, when it comes to the speed at which an object is printed out, the DLP printers are much faster than that of SLA printers. The main reason to why DLP printers can print out an object in such less time is because of its ability to allow light to fall on an entire layer at once. This automatically helps to solidify an entire layer at once. Thus saving a lot of precious time and that too without compromising on precision and accuracy. The SLS process, just as the name suggest is based on the use of lasers to print out the desired object. Although the working principle of the SLS process is quite similar to that of Stereolithography technology, the main difference is in the type of laser used and the type of materials. The process makes use of high intensity CO2 lasers and the material used may be finely powdered nylon, glass, metal or ceramic material. Also one more very important difference between the SLS and SLA process is the way the material is used. Since in case of the SLA process, the material being used is usually a liquid resin. The stability of an object was largely compromised. However, in case of the SLS process, due to the use of a powdered composition. It automatically helps to keep the printed out object stable and not lose its structure in any way due to constant movement of the machine. The EBM process is mainly used for printing out metal objects. The working principle although quite similar to that of SLS, differs mainly when it comes to the material used and the source of light being used to solidify the material. The material used in this process is mainly metal powder and the light or heat source which is used is an electron beam which is made to pass through a vacuum chamber. The light source or beam first comes out of the High Voltage source. This beam is the amplified and magnified by the Incandescent Cathode and Bias Cup. Once it passes through the Bias Cup, the beam then passes through the Primary Anode. The electron beam then passes through the Focusing Coil which helps in converging and focusing the electron beam after which the beam is deflected or moved in different direction by the Deflection Coil. This beam is lastly focused on the Weld Bead to print out the desired object from the metallic powder present inside the vacuum chamber. In this process of 3D Printing the whole machine is divided into two large sections. One part consists of a Powder Feed Piston, Powder Supply and a Levelling Roller and a Powder Feed Piston whereas the other section consists of the main Powder Bed, Binder Feeders, Inkjet Print head and a Build Piston. Now, when it comes to the working of the printer, it too may be divided into two sections. The powdered material to be used is kept above the Powder Feed Piston, which gradually rises to allow the Levelling Roller to drag it and move it into the next section. In the later section the Binder Feeders with the help of the Inkjets sprays the material being jetted with the material layer deposited by the roller. Once the jetted material is fused with the powdered material, it solidifies and forms as layer all at once. After this the Build Piston comes down gradually. Similarly, this whole process repeats itself one layer at a time. And in this way the whole object gets printed out in the later section. This process includes the use of a Position Belt, Position Sensor, Print Head and a Heater which is placed below the Build Bed. As the name itself suggest a Material Jetting printer jets out the build material which is either in the molten state or the liquid state onto the Build Bed. The Position Sensor senses the Position and displaces the Print Head accordingly. Once a layer is deposited, an Ultraviolet ray of light is passed through it to solidify the deposited material. The Position Belt along with the Position Sensor helps in moving the Print Head unit, from one position to the other. This process too gives accurate and precise finish of objects printed out. Moreover, in this process a single object can be built from multiple materials all at once. In this process too, the material used for the object is usually Photopolymers like that in case of SLA. Similar to the process of Printing, the type of material too plays a great deal in deciding the quality and property of a printed object. Thus, to understand better let us have a look at the different materials being used and its properties. Firstly, let us have a look at the most common type of material used for printing our 3D Objects i.e. Plastics or Polymer. The types of plastics most commonly in use may be ABS, PLA, Nylon and sometimes LayWood. Out of all the types Nylon, ABS and PLA is the most commonly used out of all four. Nylon which is commonly used in powdered form gives a stronger and durable final product. As for Nylon, the colour is mainly white whereas in case of ABS there are multiple colours which is available. Also when we talk about ABS, it is most commonly found and bought in filaments which are much easier to use and is provides much cleanliness when it comes to working with such material. On the other hand, PLA may commonly be referred to as a bio-degradable polymer material which can be used in both liquid resin format as well as filament form. It too offers a wide range of colours and is durable along with being flexible as well. When it comes to metals, they are mainly used in industrial end 3D Printing. The most common types of metals currently used are cobalt and aluminium. Moreover, stainless steel and metal like titanium is also widely used for printing out durable 3D Objects to be used for industrial and factory purposes. NOTE: We have only described metals and plastics under the various types of build materials as these are the most popular types being used at present. The other types are specifically used for different purposes and has not yet been so popular at the user end. For example, in case of Bio Materials, 3D Printing in this case is mainly being researched and used for printing out organs or living tissue for medical purposes. Similarly, as for Food, they too are mainly used for printing out objects made out of food products.